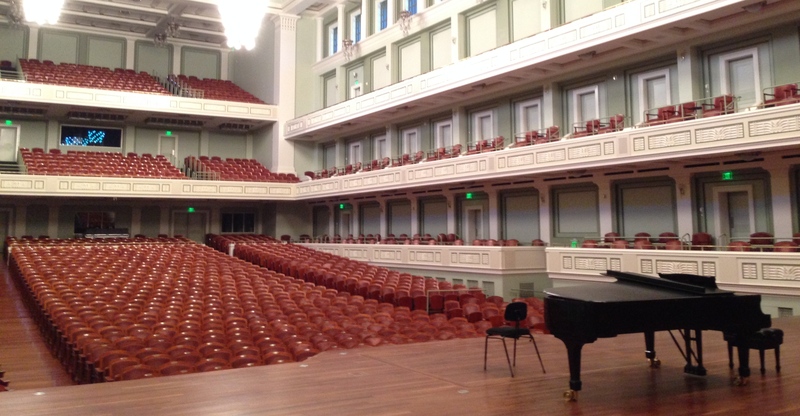 This is an open letter discussing some policy changes (changes to the rules) for the annual Curb Concerto Competition at Schermerhorn Symphony Center this season. Student musicians who are considering auditioning for the competition – which will be held on March 5 & 6, 2016 – are advised to read carefully through these changes, as are their teachers and anyone else involved in helping students prepare for this event. Click here to access the complete guidelines and calendar regulating the competition posted on the Nashville Symphony website. Please refer to this webpage for many details not discussed in this letter. The purpose of this letter is to draw your attention to changes that have been made for the 2016 competition from the way things have been done in previous years. These changes may affect the preparation of your audition, and how early you make your application. Eligibility: The Curb Concerto Competition is open to students ages 14-18 who have not yet graduated from high school. Both of these requirements must be met in order for a student to be eligible – students who meet the age requirement but have already graduated from high school are not eligible. The audition selection length must not exceed ten minutes. An applicant’s concerto movement may exceed ten minutes, however the selection performed in the competition must fit within this time constraint. If necessary, cuts may be made to the selection performed (preferably to tuttis in the accompaniment) for the competition and must be indicated in the scores provided. Applicants must be prepared to perform the entire movement should they proceed to the final round, even if it exceeds the ten minute limit. Contestants whose selection exceeds ten minutes in the first round of the competition will be disqualified. The same piece must be performed during both rounds of competition. This year’s Curb Concerto Competition will be limited to no more than 24 contestants. After 24 qualifying applications are complete, no more submissions will be accepted, and entry to the competition will be closed: even if the entry deadline has not yet arrived. To best ensure your acceptance to the competition, complete your application as early as possible. All submissions are due (postmarked) by Friday, January 29th, 2016 or until all audition slots have been filled. Registration for the 2016 Curb Concerto Competition is now open. Registration for the 2016 Curb Concerto Competition will open November 30, 2015. By walterbitner in Concerto Competition & Side By Side, Education, Music Education, Nashville Symphony, Nashville Symphony Programs, Uncategorized on August 25, 2015 .